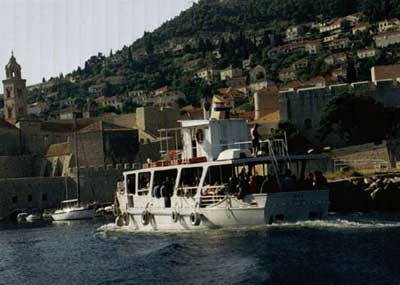 This wellknown island is situated just outside the ancient town of Dubrovnik. There are boats leaving the old harbour every hour on the hour. Return from Lokrum at 20 minutes past every hour. Traveltime is about 10 minutes and the price for a roundtrip is 15 kuna (3.75 DM, 1.9 $US) for adults and 5 kuna (1.25 DM, 0.63 $US) for children. From the harbour at Lokrum there is a 5-10 minutes walk to the nudist beach. Just follow the road to the left after debarking the vessel. There are clear signs showing you the way. After a slight climbing of the road you´re entering the nudist area. If you prefer an easy access to the crystal clear water you turn directly to the left after the sign. Here is the freshwater shower and some excellent places to stay in the sun. It is a little bit more crowded here. This is the place where most of the locals stay. But if you prefer a place more for yourself you just continue until you have found what you are looking for. 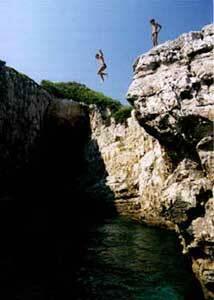 At the end of the naturist area you will come to a natural inlet well worth seeing. In the caves you can find some bats. I can recommend a swimming tour along the nudist beach from one end to the other. It is a good excersice in a fantastic clear and salt water. And if the currents happen to be too strong that day, you can always walk back. Some not so strong currents can occur in the afternoon but will be no problem at all for your safety. 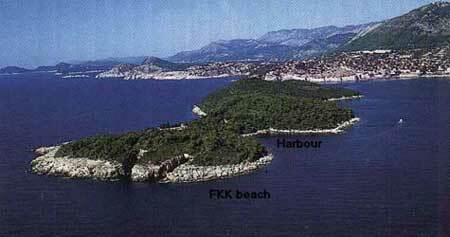 Lokrum is a National park with a very interesting history. There is a Botanical garden, a Benedictine monastary and a unique lake named "Mrtvo More", The Dead Sea, in the middle of the island. It contains fresh salt water as it is linked with the open sea through underwater tunnels from the end of the inlets. I strongly recommend you to take a walk around Lokrum to admire its beauty. On the western side of the island and at the harbour are the textile beaches. Here are also some showers. There is a restaurant at the monastary and a coffebar close to the harbour. Both with human prices. There are also some waterfountains with fully drinkable water at the island . All water in Dubrovnik comes fresh directly from wells at Mount Srdj and is very fine. Completely safe for vounerable tourist stomachs. 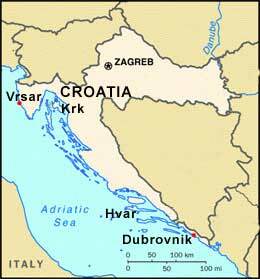 After a long, fine day at Lokrum you take the ferry back to Dubrovnik for an evening at a fine restaurant and maybe a glass or two at a bar. Thanks Reine Simonsson for this report.